HOUSTON (November 27, 2017) – Mobil Steel International, Inc. helped sponsor the Associated Builders and Contractors Greater Houston quarterly breakfast meeting that featured Harris County Judge Ed Emmett. Judge Emmett provided updates on Hurricane Harvey impacts, including necessary funding and programs to help the region recover and to prevent future flooding. Many of the ABC members at the meeting are helping business, industry and municipalities recover from Harvey’s impact. 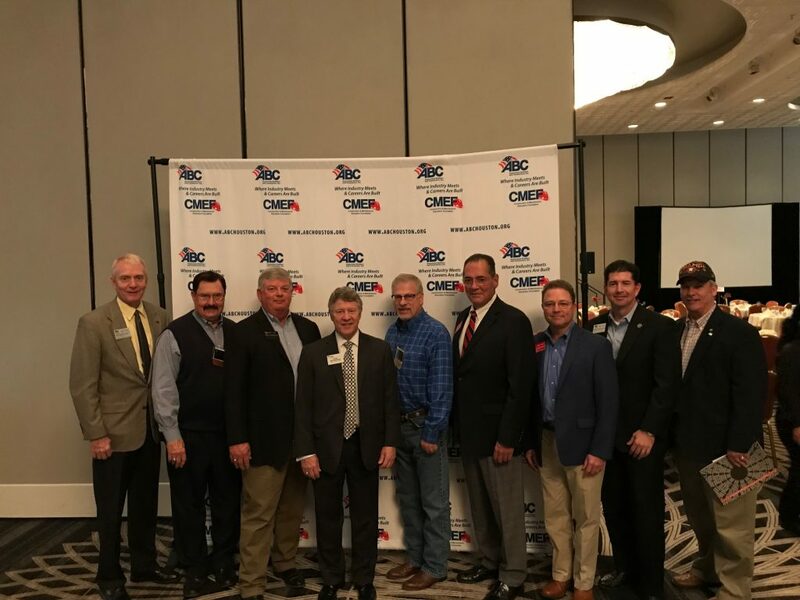 Before Judge Emmett delivered his keynote address about Hurricane Harvey impacts and support for regional recovery, ABC recognized member companies for Excellence in Construction and highlighted ABC workforce development initiatives in Houston-area high schools to attract and develop employees for construction careers. “It is a benefit to ABC, Mobil Steel and our industry when we talk about the success of our industry and share industry issues with our elected officials¸” said Leonard A. Bedell, President and CEO of Mobil Steel. Also attending the meeting and sitting with Mobil Steel was City of Houston Council Member Mike Laster representing District J. Council Member Laster shares ABC’s interest in getting young Houstonians prepared for careers. He also spent time with Michael Richter, Vice President of Education and Workforce Development for ABC Greater Houston. Richter shared ABC workforce initiatives, including an ABC program in 62 Houston-area high schools that helps attract students to careers in construction. “It is important that we help develop a skilled workforce to work in our industry, which is the industry that will help the Houston area recover and is critically important to the growth of our region, state and the United States,” Bedell added. The ABC Greater Houston chapter promotes free enterprise philosophy and has programs to promote construction careers with enhanced training, good wages, benefits and a safe work environment. “It is imperative that we continue to emphasize a program to recruit and develop the skilled crafts workers that will be needed as we continue to grow the economy in Texas,” said Bedell. He added that he was proud that Mobil Steel fabricates steel for the manufacturing and petrochemical industries which have been experiencing growth and expansion in our region and driving the Texas and U.S. economies. Judge Ed Emmett provided an update to Associated Builders and Contractors members about Hurricane Harvey impacts, including funding and programs to help the region recover and prevent future flooding. Many ABC members are helping business, industry and municipalities recover from Harvey’s impact. Pictured with Judge Emmett is ABC president Russell Hamley, PAC trustees Leonard A. Bedell and Dale Kornegay, Judge Emmett, ABC PAC trustees Mark Rush, William Sanchez, Dwayne Boudreaux, Robert Burelsmith and Warren Adamson. Mobil Steel International, Inc. fabricates steel used in some of the world’s essential industries: chemical, manufacturing, petroleum, communication, clean fuels, and power utilities, as well as commercial construction. Mobil Steel, which has been at its South Wayside Drive facility in Houston for 44 years, has a production capacity of more than 1,000 tons per month in its 80,000 square feet of plant and office facilities under roof, providing flexibility to manage multiple projects. The 8.5-acre site is located within major freeway access to the refining and petrochemical complex in the Gulf Coast region. Mobil Steel is quality certified by the American Institute of Steel Construction (AISC). Mobil Steel is active in Associated Builders and Contractors, Associated General Contractors, Association of Chemical Industry of Texas, and American Welding Society. The company is a sponsoring member of Economic Alliance Houston Port Region and a member of the Pasadena Chamber of Commerce. Mobil Steel is a registered small business with the Small Business Administration. For information about Mobil Steel visit www.mobilsteel.com.